Today, July 31st, makes a very special day in the heart of many readers around the globe. Today is Harry Potter’s (and good ol’ JKR’s) birthday. And whilst the birthday of a (supposedly (I’ve always held hope)) fictional character may not seem like a cause to celebrate, I will always have a little bit of extra magic in my day for him. Harry Potter was a huge part of my formative years in a way I will never forget. Growing up in a homeschool community, reading Harry Potter was VERY rebellious. Afterall, it contained witchcraft… That’s pretty sketch. Nonetheless, my parent’s allowed this obvious draw to the dark arts, and I was hooked from the first word. Harry Potter became my happy place. By the time I was interested in reading them, Deathly Hallows had just been released, thus allowing me to deveour the whole series in a matter of days. In fact, I remember my parents taking my copy away to prevent me from staying up all night reading them (as well as an attempt to get me to read them at a reasonable pace) and I just rode my bike to the library because I couldn’t stop. Harry Potter, and the the magical world within, helped me spark an interest in reading deeper than I ever had before. I was a huge reader in my childhood, but until Harry I always insisted on reading classic literature, to prove my intellect. When I read Harry Potter it was the first time I truly remember becoming lost in a book, and not wanting it to ever end. Harry Potter is a huge part of why I have a passion for literacy/literature today, and is a major aspect of why this blog is in existence (ie – a time portal to one of my very first posts (many embarrassing HP posts are available via the search)). It’s been awhile since I’ve sat down with Harry for a visit, but that doesn’t change the impact that he’s had on my life and imagination. So, I wanted to give him a little shout out on his birthday. 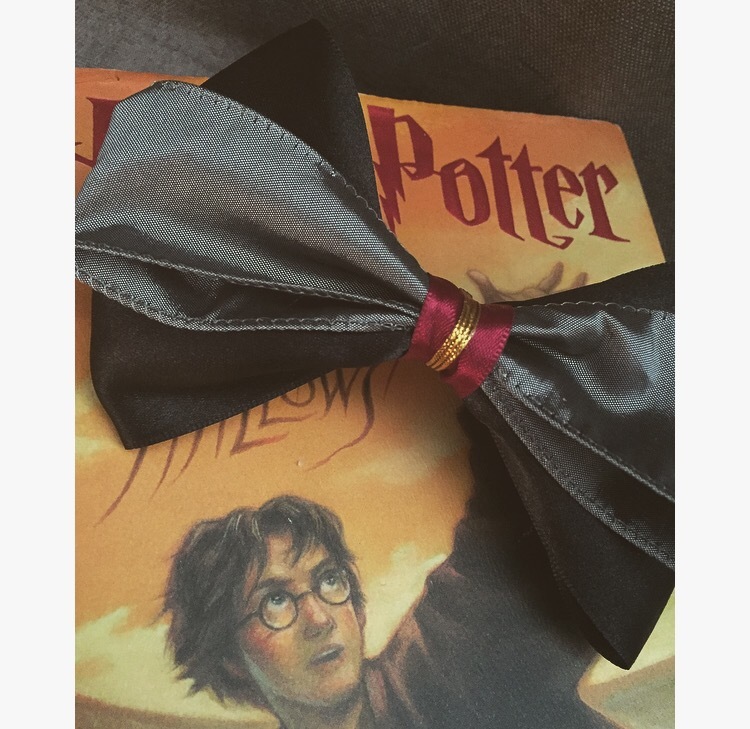 (ps – featured is a Harry Potter themed bow that I have available on my IG (snowwhiteandthe7bows, and that will be up on my etsy when I reopen there).